Q: Is BP Oil Spill’s COREXIT Causing Horrific Red Tide in West Florida Now? This entry was posted in oddity, oil & gas industry, science, U.S., unverified and tagged BP oil spill, Oil Plus Dispersants May Lead to More Red Tide Events, Oil Spills and Dispersants Can Cause the Initiation of Potentially Harmful Dinoflagellate Blooms, red tide, red tide blooms COREXIT, Red Tides and Corexit. Bookmark the permalink. I was just thinking this exact same thing. They are trying to cover it up but know there is a correlation. 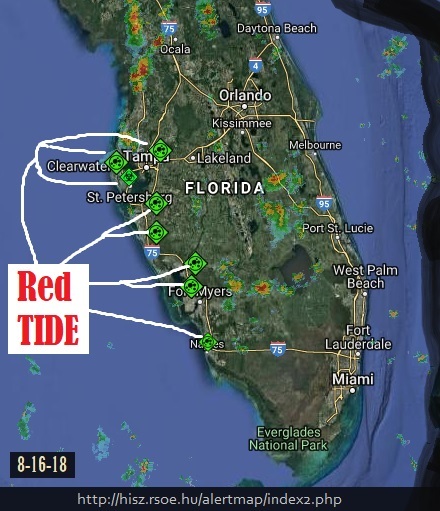 “The Red Tide starts as natural growth of the “bad algae” dozens of miles off shore near the continental shelf. That algae can then drift toward shore and enter brackish water inlets. The blooms are not stimulated in open circulating waters. However, they are stimulated to grow and get bigger in the presence of manmade nutrients, such as fertilizers that have run into water sources from agricultural production all over the Gulf of Mexico. I knew I count on Bugle readers to add extra info.